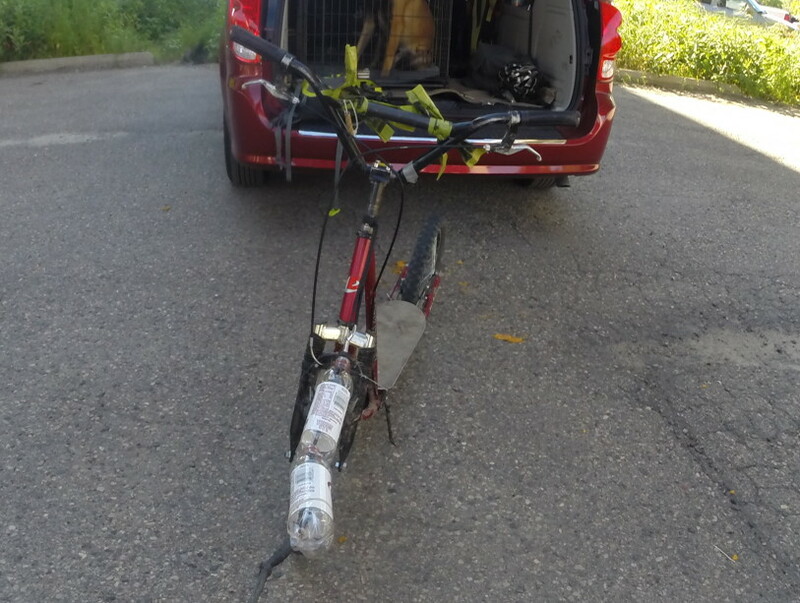 Recently my husband and I took the mushvan for a short road trip, an opportunity I used to clean it out very thoroughly which meant temporarily moving all the gear onto the back porch. Usually if I forget to put something back in the vehicle after cleaning it out, it’s my helmet. So I was really proud of myself today for remembering it until I suddenly realized about halfway out to the trail that I had forgotten my usual tugline. I have plenty of extra lines, connectors, and snaps in a toolbox I keep in the van, but the one thing I do not have a duplicate of is the noodle. The noodle, as many of you know, protects and prevents the line from tangling in the front tire in the event of any slack. This can be annoying at best and dangerous at worst (think of suddenly braking the front tire and flipping over the handlebars). My usual noodle is made of a short length of PVC pipe attached to the near end of the tugline. Toast and Maisy (who I was taking out today) tend to keep the line tighter, but nobody’s perfect. So here I was with a choice: Go back (grooooan), keep going but canicross instead of scooter (booooo), or keep going and just take my chances without a noodle. Then my eye fell upon a couple of empty pop bottles in the drink holders, and a fourth option opened itself up to me. I was about to turn my Diet Dr. Pepper addiction into something useful. 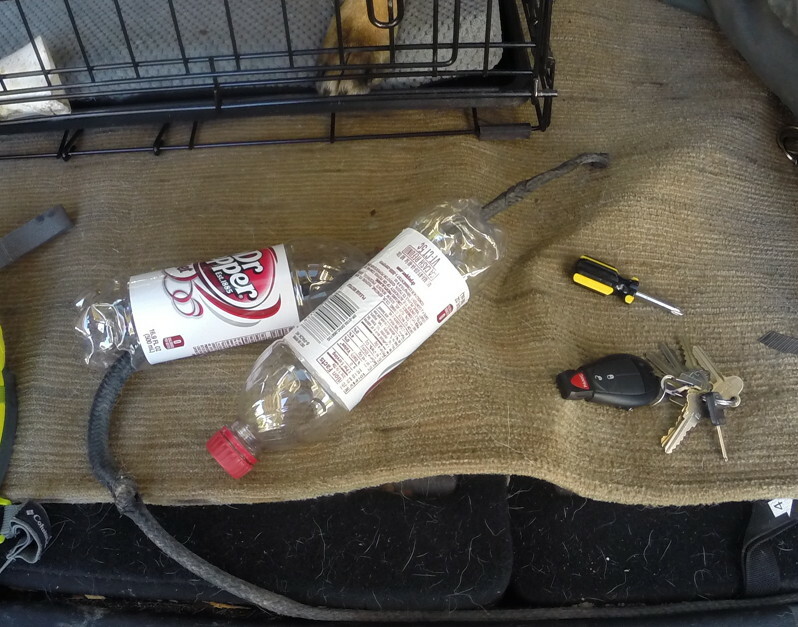 My tools: Empty pop bottles, a screwdriver, keys, and (not pictured) a rubber band. Normally I carry a small utility tool and a tiny pocketknife with my gear which would have made this easier, but I used what I had on hand. I poked a hole near the bottom of each bottle with the screwdriver, used a key to saw a bigger opening, and just threaded the bottles onto the line. A rubber band to hold the forward bottle in place, and we were off! It wasn’t pretty and it was kind of noisy, but it was effective and it is now safely nestled in my toolbox with the rest of the extra equipment. And THAT’S how you DIY. BOOM. This entry was posted in Equipment, Scootering. Bookmark the permalink.